The most common search term for PowerMark printing material is "PowerMark Vinyl". 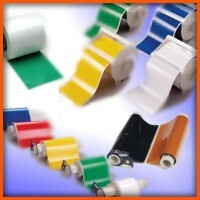 PowerMark vinyl is designed to be used in the PowerMark sign and label printer, and comes in a pre-loaded cartridge. To make sure that the vinyl cartridge is used in the correct printer, Brady incorporates special supply ID hardware in the PowerMark printer. A chip is also inside the PowerMark vinyl supply cartridges, which allows the printer to operate only when loaded with a Brady or compatible cartridge. These are a few of the many catalog numbers for commonly used Brady PowerMark vinyl tapes. These are just examples of the many supplies that are available for the Brady PowerMark label printer.